CALCIUM REACTORS - Do I Really Need One? But do you actually require a calcium reactor? Just what is a calcium reactor anyway? Is it really so important? The first piece of advice I should offer is to not be scared by the various aquarium supplies available. A large amount of technology being sold might seem huge at first but remember that you don't really need all of this additional equipment. Be sensible, do some research on each item and determine whether you do need their help to keep the environment in your aquarium clean. Secondly - calcium reactors. So just what is a calcium reactor? 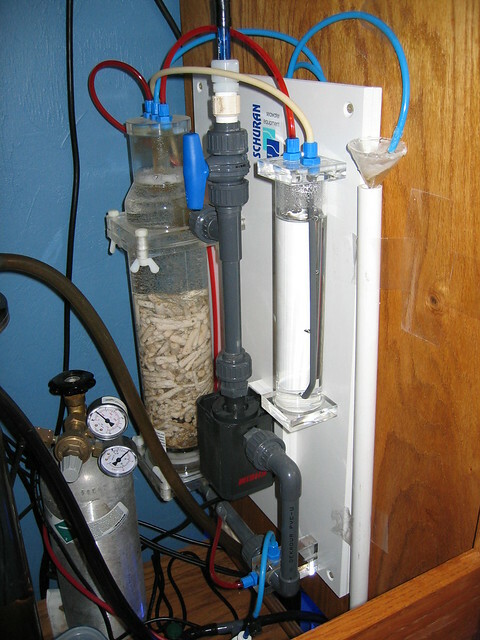 A calcium reactor is a piece of aquarium equipment designed to keep the level of calcium in your water high. This is especially useful if there is a particular drain on calcium levels in the aquarium. A lack of calcium can occur when there are several saltwater fish in a tank but is more often caused by placing a reef in the tank with them. For those with reef tanks, it is crucial to have a calcium reactor. Most species of fish are vulnerable to fluctuating calcium levels and will be badly affected if the calcium content reaches a certain level. Additional costs such as calcium reactors will certainly increase the overall cost of an aquarium. However, it is important to see that they can also provide you with the ability to keep more exotic and diverse tanks. Anyone can create a basic freshwater aquarium, but a diverse marine tank including coral life is far more complex and impressive, and also a challenge to maintain correctly. So rather than focusing on the costs of such a challenge think of what an opportunity you will be giving yourself. But don't stress; you shouldn't need to buy a calcium reactor immediately. In fact, it should be several weeks before the calcium in the tank will need to be altered. Only when you've populated your tank fully will it become necessary.